What Does It Take To Have A Magnetic Culture? 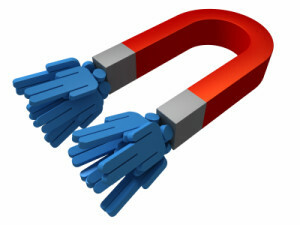 Organizations with a magnetic culture attract the best talent and customers. So what is a magnetic culture? It is a culture where team members enjoy being a part of the team. They are more connected to the organization then the paycheck. The culture is so magnetic that it would literally take an offer they cannot refuse in order for them to even consider leaving. Customers are willing to pay more because they love the relationship they have built with the brand, the product, and the people. How can you create a magnetic culture? Well, before you can build a magnetic relationship with your customer there must be a magnetic relationship within the organization. Great organization are built from inside out, not outside in. Here are some common characteristics of organizations with a magnetic culture. Share A Common Vision: Team members of a magnetic organization share a common vision. As humans we need a destination. We are conquerors. Just as President Kennedy put before our nation the challenge of putting a man on the moon before the end of the decade during his 1961 speech, organizations must set a destination for their team. Magnetic organizations do a great job of putting a clear and precise vision before their team. They create excitement and pride toward accomplishing that vision as a team. Invest In Each Team Member: Once the vision is set magnetic organizations turn their focus to assembling and training the best possible team to accomplish their goals. President Kennedy ask for 9 billion dollars over 5 years to ensure that their vision was realized. As the leader of this very lofty vision President Kennedy understood that he had to invest in the training and education of the NASA team. In addition he had to provide the resources necessary to accomplish the mission set before them. In order to accomplish the mission organizations must have highly trained and motivated team members. Investing in their continued education and providing them with opportunities to enhance their professional experience will set the organization up for success. Solve Problems Together: Embrace problems that arise and solve them as a team. Find me an organization without problems and I will show you an organization that is not in business. If there were not any problems guess who they would not need anymore….Y-O-U. Magnetic organizations identify problems that are a threat to accomplishing the mission. Once the problems are identified, set them before the team and work together to solve them. Celebrate Successes: Organizations with a magnetic culture take every opportunity to celebrate success. If you want success repeated then celebrate when it happens. Magnetic organizations have short-term and intermediate goals. These goals are specific and measurable. Accomplishing these goals will ensure the team is on the path to reaching the overall vision of the organization. As these goals are reached they take time to celebrate the team and individuals for their accomplishments and hard work. Focus on creating a magnetic culture at your organization and watch performance excel. It all begins with creating a shared common vision through your mission statement.